Indeed, dead men tell no tales but your breathing feline friend can with a Jack Sparrow-inspired Halloween costume. A cute pirate hat, with the skull and swords emblem, would be adorable on an American Bobtail cat. Add a vintage pirate shirt with a pristine little sword and that's it! Just how adorable is Chewbacca from Star Wars? We all loved his co-piloting skills and funny Wookiee dialect. Since the real Chewbacca cannot make that Halloween visit to your home, we can reincarnate him in your pet Chow Chow. A Pomeranian, Alaskan Malamute, or a Keeshond would make a great Wookiee character in a Chowbacca Halloween costume for dogs. If you own a Cornish Rex or a Devon Rex, this would be a perfect costume for the little fellow. It could be a handmade Batman mask to conceal his true identity as he goes out to fight crime (read rodents). Alternatively, get your cat some bat wings and tiny little fangs to scare the trick-or-treaters away (seriously though, don't scare them). Travel with your pooch to the Jurassic world with a Halloween dinosaur costume for dogs. It could be a T-rex, Pterodactyl, or Spinosaurus, just about any dinosaur costume you can think of would fit your pooch perfectly. Decorate your home with a Jurassic theme or dress up your cave men so your pooch can know you are in it together. A cuddly kitty in a red cloak and a basket of apples beside it is something you do not see often. Hats off if you get to dress your pet dog as the big bad wolf. Why not turn this into a full photoshoot by adding a backdrop of a creepy forest. Hey, we just gave you an idea for your next Halloween postcard! Dog Halloween costumes don't always have to be scary. You can choose something funny for your pooch like a pope's costume. Get your pooch in a pope's house dress then throw over an embroidered papal coat. Now get the pope's cape on his head and send him out to vanquish the Halloween devils. Of all the cat Halloween costumes you can try, this should be the scariest, if not hilarious, one. It looks exactly like a spider with all eight legs spread out. Once the cat has the costume on, let him run around the house causing yelps in everyone he meets. Your pug may probably not forgive you for this but it is worth the laugh. Have her in a cute little princess tutu, pink leg warmers, and a glittery tiara. Take as many funny photos with her before she grows impatient. And don’t worry, a treat or two will be enough to earn her trust again. Do you have a toy breed with a really big personality? He will definitely pull out the Frankenstein look pawfectly. The dark green attire with black and white accents will fit any pug, Chihuahua, or poodle with a dark coat. Add some realness to it by painting stitches on the pup’s face; just make sure he doesn’t lick them off. Coffee enthusiasts would definitely love dressing up their feline pet in a latte cup costume. But be warned, Kitty might not like it and will even try and wriggle out of this strange costume. That’s your cue to start taking photos and sharing them with friends for a good laugh. Go all out this Halloween and let your pooch spot a steampunk Mohawk. Add some color spray to add a touch of 1984 complete with a studded collar and a leather coat. 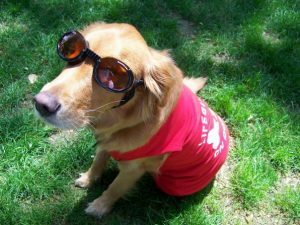 It doesn't have to end here, throw in some steampunk boots and let your pooch party like it's the 80s. 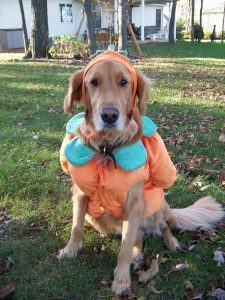 Who does not like humor with a dash of irony in their pet Halloween costumes? A cute and cuddly little Kitty in a hot dog costume. Definitely out of the norm and one look at the adorable purring fellow will leave you hugging him for days. No one will want to break the law when your hyped-up Labrador walks into the room in full police uniform. Get him the whole ensemble which includes a walkie-talkie, cuffs, a whistle, and a badge with his name on it. If you have another pet in the house, dress it in an orange prison suit. Who isn't terrified of a mean-faced doll wielding a deadly knife? Time to put that to the test with Ginger. There is plenty of pet Halloween costumes online inspired by Chucky. Your kitty's front paws become Chucky's two feet and there is an arm protruding from the costume wielding a knife. We all know that one dog that could pass as the Yoda. It definitely is a pug; flat solemn face who becomes Yoda when he grins. What makes this whole attire adorable is the wide dark eyes that ooze of pug innocence. Surprise your pet with one of this fun and hilarious pet Halloween costumes. 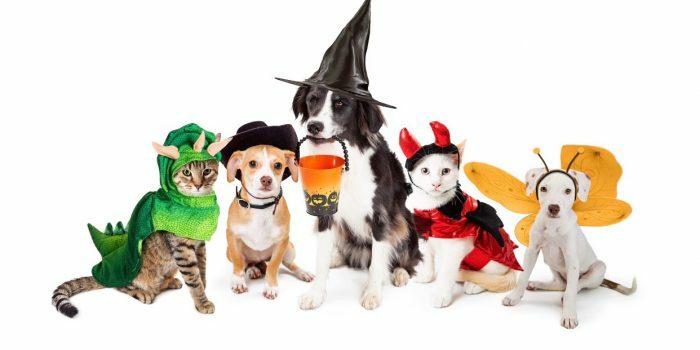 And if you need someone to keep an eye on your beloved pet as you get into the Halloween festivities, we at Pawsitive Purfection will be glad to help. Happy Halloween from us! 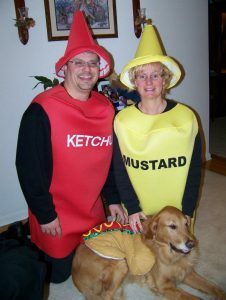 Cooper hotdog with Mom & Dad condiments!